As the Japanese government sets out its new National Defense Program Guidelines defense capability target policy that will guide the upcoming Medium-Term Defense Program (Japan’s military acquisition plan), two major considerations are in play that are intended to complement each other. The first involves an $8.8 billion (JPY1 trillion) purchase of up to 100 more F-35 stealth combat aircraft to supplement Japan’s 42-unit planned buy. This legacy order involves the F-35A conventional takeoff and landing variant, which will serve as the successor to the aging F-4EJ Phantom fleet brought into service in the early 1980s. Japan has already ordered 28 of its 42 units under the current Medium-Term Defense Program covering fiscal years 2014 through 2018. The final 38 F-35s under this 42-unit order will be assembled at Mitsubishi Heavy Industries’ Final Assembly and Checkout (FACO) facility in Nagoya. Now with another F-35 order for 100 units under strong consideration, the aim is to procure a mixed fleet of F-35A and F-35 “B” short takeoff and vertical landing (STOVL) variants. This would allow for the F-35B jump-jets to operate at sea, a forward-focused combat capability that defense-oriented Japan has not had since the Second World War. The potential F-35B order arises from the second major consideration in Japanese defense policy planning circles: the retrofitting of the Japan Maritime Self-Defense Force’s pair of Izumo-class helicopter-carrying destroyers into aircraft carriers, This is an expensive proposition that, when added to a potential F-35B buy, would cost Japan around $4 billion for customization of the two ships plus their aircraft complements. Reports that the government has been conducting studies on an Izumo-class carrier conversion have circulated since earlier in the year, and in May the ruling Liberal Democratic Party called for introducing a “multipurpose aircraft carrier” proposal in the next National Defense Program Guidelines. Now with the government reviewing its existing National Defense Program Guidelines (last updated in 2013 and intended to cover a roughly 10-year period) with the intention of adopting a revised policy approach in mid-December, the idea of a ship conversion has picked up steam. But such a step comes with hurdles, beginning with whether converting the ships into aircraft carriers would violate Japan’s Constitution. The country is restricted from waging aggressive war per Article 9 of its 1947 pacifist Constitution, which dictates that Japan should maintain a strictly defensive military posture. Prime Minister Shinzo Abe, however, has never shied away from stretching the spirit of Article 9 in an attempt to ensure Japan’s defense posture remains in step with its present security environment. That environment includes confronting North Korea’s nuclear and missile development programs and an aggressive Chinese military buildup and approach to territorial disputes. In particular, China remains at odds with Japan over Tokyo’s claims and control over the Senkaku Islands, a series of tiny, rocky outcroppings at the furthermost point of Japan’s outlying Southwest Island chain. The vulnerability of the Southwest Island chain to Chinese provocations has prompted Abe’s government to stand up an Amphibious Preparatory Unit within the Japan Ground Self-Defense Force (JGSDF) that will be charged with responding to attacks on Japan’s remote islands. It also encompasses utilizing the presumed converted Izumo-class carriers as a means of reducing the distance between Japan’s air bases and its outermost – and by extension its most vulnerable – islands. The closest air base to the Senkaku Islands is in Okinawa, 440 kilometers (273 miles) away. A carrier’s ability to provide air cover to these distant islands thus improves Japan’s defensive capability by extending its reach. This appears to be the legal hilltop upon which the Abe government intends to make its stand against criticism that it is promoting policies ranging outside the boundary of Japan’s traditional postwar senshu boei (exclusively defensive-oriented) defense approach. Abe has staked a lot of political capital on security legislation before and emerged unbowed. Three years ago his government was able to pass new security bills allowing Japan’s Self-Defense Force to provide logistical support for allies engaged in military operations and, more crucially, to allow the SDF to come to the aid of an ally when under attack (one whose fighting does not necessarily have to involve defense of Japan, either). This was landscape-altering for Japan’s security posture. Ultimately the Abe government may get what it reportedly seeks through the revised National Defense Program Guidelines. 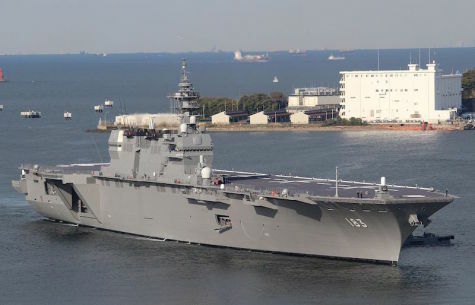 But whether converting the Izumo-class destroyers into small-deck carriers in order to operate a tiny complement of 10-12 F-35Bs on board represents the most cost-effective and tactically shrewd way to defend the far-away Senkaku Islands is another question.